A Salter-Style® cannula specifically designed for use with Dual Port Oxygen Conservation Delivery systems. Adult, Small Adult/Pediatric sizes with 4', 5', 7' supply tubes.This special model retains all the Salter-Style® comfort while filling a specific task. It has dual tubing and permanent facepiece barrier for use with a dual port style oxygen conserver device. 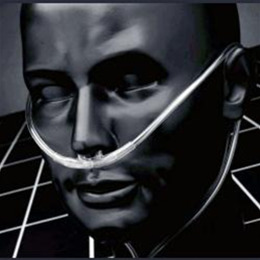 One side of the tubing senses patient inhalation and the second tube delivers oxygen to the other nostril. This Cannula meets the specifications of all dual port oxygen conserving devices. Available in adult, small adult or pediatric sizes. Selection of tubing lengths are limited to assure optimum performance.